This is the message to our KONP members 26 April 2016: With great sadness we must announce the sudden and unexpected death of our comrade and friend, Tony Marshall, who died in his sleep 10 days ago. Tony was an active member of Camden KONP and has fought alongside others passionate to fight to save our NHS. Tony was retired from his career as a respected journalist and was an excellent photographer. Part of Tony’s legacy is his contribution to setting KONP on a firm footing to strengthen our battle for the NHS, as he tirelessly helped us through KONP’s constitutional elections before Christmas as part of the election committee with Gilda Peterson and Coral Jones. KONP owes him a debt of gratitude for this. Tony’s latest and sadly his final triumph as a campaigner had been the outcome of his campaigning in Camden to expose the deficiencies of Care UK and their predecessor Harmoni in their performance of the Out of Hours primary care contract in Camden and Islington. He helped engage widespread local support in the process. 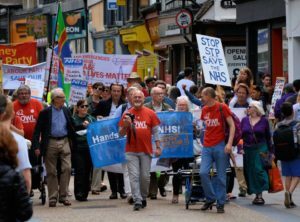 When the Out of Hours contract was re-tendered on a five-borough basis, Tony was instrumental in bringing people together from across the five boroughs to campaign for the contract to go to local GPs. It is good to know that Tony was able to celebrate the success of the campaign in ousting Care UK before his untimely death. He was a man of integrity and intelligence. We are very sad that we have lost him. We send our sincere condolences to his family. May he rest in peace. We will always remember Stuart’s enormous contribution to the Save Lewisham Hospital Campaign. From the early day, as a video maker, he captured in film our entire campaign. His was an extraordinary contribution: he saw the importance of documenting the growing strength and confidence of the Lewisham community, campaigners and supporters. This made a real difference to our campaign, enabling us to reach thousands upon thousands of people beyond Lewisham at the time, and to share the optimism and achievements of Lewisham up and down the land. Stuart was proud to be a campaigner with us and so pleased when elected as a steering committee member. 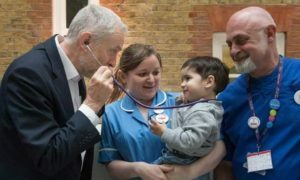 No-one – porter, domestic, nurse, medic or Consultant – got within a few feet of Sam in hospital without being asked their attitude to the Private Finance Initiative (PFI), or the latest government plans to undermine the NHS. 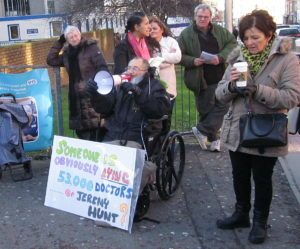 During the Junior Doctors strike, he persuaded staff to let him appear at the Atrium window above the demonstration in the ambulance forecourt. Sam phoned through to a mobile pressed to the megafone and addressed the strikers. Good morning everybody. I am a patient on the Cardiology ward here in the Royal. I’ve been in here two weeks and I can tell you the care has been absolutely great. Hunt is also a hypocrite – he talks about patient safety, yet he wants to remove requirements that limit junior doctors working unsafe hours, putting patients lives at risk. The doctors went into medicine to help people, their main concern is their patients’ needs above all else… Hunt knows this and takes advantage of it, he thinks he can push them to the limit and they will not do anything. The Government is determined to decimate the NHS and turn it into a market based health care system like in America. They have eroded the principles of universality, of a comprehensive integrated service that is publicly accountable and they are now working to undermine publicly provided, as the NHS is broken up into bits and turned over to the private sector where the overriding aim is profit. Sam turned his energy to setting up the Somali mental health project, MAAN. This aimed to raise the profile of mental health, and bridge the gap between the community and the mental health institutions – which knew little of the Somali community. It transformed the way the community viewed mental health, breaking the taboo, and educated the mental health trust. MAAN workers accompanied GPs on patient visits. Eventually the grants ran out, despite Sam’s best efforts. Meanwhile he volunteered, helping Somali women with welfare rights. Sam worked with Katy on a proposed study at Princes Park, to explore why Somali women were not taking their blood pressure medication and why health workers didn’t appreciate or understand the reasons. Eventually, he got ethical approval for the research, only to be overtaken by his own illness. To top it off, NHS England handed the management of a dozen Liverpool surgeries, including Princes Park, to the private firm SSP. That wasn’t just an affront to Sam’s politics. It was personal. Sam hit back with 10,000 leaflets in Arabic, English and Somali, delivered door to door and to every shop on Lodge Lane. He had been Sec. of Granby Ward Labour Party, and ran this like an election campaign. Sam led the fight against PFI funding for the new Royal Hospital. He was vilified in the Echo, which ran the scurrilous headline “Bogoff Semoff”, claiming that an American was trying to deny healthcare to the people of Liverpool. No-one ever apologised for that, even when the newspaper finally woke up to the PFI catastrophes at Whiston Hospital and around the country. Sam brought a Judicial Review which forced the Royal to re-run their consultation as they had not even mentioned that the new hospital would be funded by PFI. Every Liverpool Labour MP backed the scheme, as did Cllr Nick Small and Joe Anderson, at that time leader of the Labour group within the Council. The Royal PFI was signed off by Andy Burnham as Health Secretary on the eve of the 2010 General Election. Sam lodged a second Judicial Review, challenging the claim that the PFI would deliver Value for Money. On 17 Nov 2010 BBC Radio Merseyside put Sam up against Joe Anderson, who declared “I know it doesn’t provide Value for Money now or in the future, but it’s the only game in town”. That admission ricocheted all the way up to a Treasury Select Committee Inquiry into PFI. But the JR was derailed when Cllr Small approached the Legal Assistance Board and got them to pull the funding for Sam’s challenge. 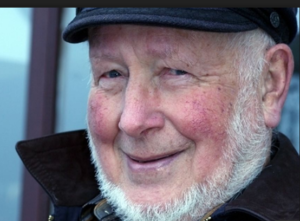 Dr Julian Tudor Hart, a founder member of the Socialist Medical Association and the first honorary President of the Socialist Health Association died on July 1, aged 91, in the week of the 70th anniversary of the NHS, which he fought so hard to improve and defend. His death is a sad loss to socialists and campaigners: but his life’s work has left us better equipped to address health inequalities, and to understand the weaknesses and contradictions that limit the effectiveness of the NHS. Although he was best known for the memorable phrase and approach of his 1971 Lancet paper on The Inverse Care Law, Julian was at the same time a consistent and relentless critic of the impact of markets on health care, which were also central to the same keynote article almost twenty years ahead of Margaret Thatcher’s government’s legislation establishing an ‘internal market’ in the NHS. These linked themes so succinctly set out in 1971 have formed a near constant focus for campaigners and progressive academics since the late 1980s. Indeed, the concept can be read more broadly to argue that those with the greatest health needs are almost always those least able to afford the market price of health care as a commodity; and it can explain why those areas facing the greatest deprivation are always those with the least political power to force change. However, Julian in his later years was increasingly reluctant to refer to the inverse care law. We might say that the importance Julian himself attached to the concept and the phrase was inversely proportional to the common acceptance and use of the term. He argued that the inverse care law detached from the wider social and political critique was relatively trite and unimportant. He was angered by the ways in which the concept had been effectively devalued and hijacked by managers and establishment politicians seeking to claim a fig-leaf of concern for health inequalities while pressing forward with policies to deepen and entrench the purchaser/provider split and market mechanisms in the NHS. For Julian, the key question was not neat phrases and clever argument, but testing and proving ideas in practice, improving not only the work of GPs but the social and organisational context in which they worked. He worked for 30 years as a general practitioner in a health centre in Glyncorrwg near Port Talbot in South Wales, which became the first recognised research practice in the UK and pioneered the regular monitoring of blood pressure, proving it could help reduce strokes and premature deaths in high risk patients. It was also characteristic of Julian to reject hierarchical notions of the GP or doctor standing above other health staff: he insisted that the doctor could only function effectively and fully as part of a team, and his research on blood pressure and other medical issues always stressed the importance of high quality records, teamwork and audit. Studies of medical out-patient consultations show that 86% of diagnosis depends entirely on what patients say, their own story. What doctors find on examination adds 6% and technical investigations (X-rays, blood tests, etc.) add another 8%. To most lay people and even some doctors these figures are astonishing, the reverse of the proportions expected. (Feasible Socialism, p 42). 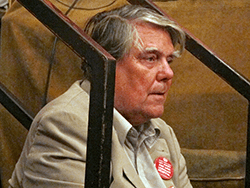 As a fierce critic of the competitive market developed by New Labour from 2000, Julian was one of the founding members of Keep Our NHS Public in 2005. His most substantial book-length study The political economy of health care was first published in 2006, with a revised second edition in 2010. The mixture of Marxist analysis and clinical perspective mean that passages can be a less easy read than Feasible Socialism, and Julian was never quite satisfied with it, but the book offers many useful insights. Julian was also active in collaboration with many experts and academics internationally, and a leading figure in the International Association of Health Policy in Europe (IAHPE): the last time I saw him speak in a public forum was at an IAHPE conference I organised at Coventry University in June 2009. In his later years Julian became less confident of his ability to set out an extended and detailed argument in writing, and the last time I met him, for lunch at a restaurant in Swansea, he persuaded me to take on the production of a book on the clash between professional ethics and the market, and the problems in developing and maintaining patient-centred care. However, this was just at the point that work began to launch Health Campaigns Together and the task fell by the wayside: Julian’s death is a powerful reminder of the need to return to this task and deliver a book worthy of its originator. Many will miss the inspiration and support we had from Julian, who was a quietly spoken, friendly but steely-willed ally, with a complete commitment to quality health care and a far-sighted Marxist understanding of the contradictions of the health care system that has arisen after almost four decades of efforts to undermine the principles of the 1948 NHS. Phillip Wearne was a journalist and documentary film-maker. He was exceptionally intelligent, knowledgeable, determined and courageous. He was extraordinarily kind-hearted and considerate and performed countless little acts of personal kindness. He was generous with his time and recklessly spendthrift with his energy. He was enraged by, and fought tirelessly against, injustice, cruelty, environmental degradation and the greed, corruption and folly of our political leaders. He was always looking for recruits to the fight, and supported and encouraged any he found. He was a loyal and caring friend and was loved and admired, and is now sorely missed, by hundreds of people around the world. The world still needs him. Phillip joined the march through Ilfracombe in 2015, organised by Green councillor, Netti Pearson, in defence of the Tyrell Hospital. He also joined the Junior Doctors’ picket line in 2016 and was one of the founding members of SOHS (Save Our Hospital Services), for which he quickly became the driving force, advising, exhorting, encouraging. He worked tirelessly, attending meetings of the group and also of the CCG and Devon County Council’s Health and Wellbeing Scrutiny Committee. He organised the leafetting (most of which he did himself) of practically every house in North Devon. He wrote letters to newspapers, he organised, or helped organise, and spoke at, SOHS’s public meetings in numerous North Devon and Torridgeside towns, for which he organised the publicity, delivering much of it himself. He encouraged contact with other health campaign groups. He spoke at rallies for the NHS in Barnstaple and London. He was a constant inspiration for the group, even when he left North Devon in the summer of 2017 to live in London, from where he continued to do research for SOHS and to send countless e-mails to its members. Phillip was an active member of several other campaigns: Stop Hinkley, Grow Heathrow, Runnymede Eco-warriors’ camp, Palestine Solidarity Campaign, CND, Campaign Against the Arms Trade, and he also supported Croughtonwatch and other groups opposed to American use of RAF bases and direction therefrom of drone attacks. 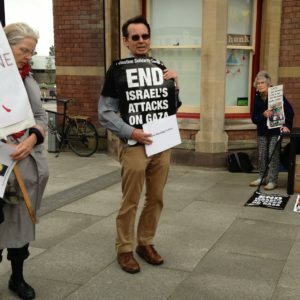 Campaigning against the arms fair in London last September he was arrested the first morning, standing in front of an Israeli tank, and spent all day in the cells. The charge against him was, much later, dropped, but day after day, for months, he attended the trials of other protesters, giving them much needed advice and moral support. In 1990 Phillip was in Haiti for the election of Jean-Bertrand Aristide and was outraged when an US-aided coup d’état toppled that government in 1991. In 1992 he joined the Haiti Support Group and very generously gave them his time and expertise. Haiti held a very important place in his heart. He kept saying that the world owed Haiti so much. He talked of the 1791 slave rebellion led by Toussaint L’Ouverture, which, in 1804, brought about the colony’s independence, the only slave uprising that led to a state free from slavery and run by non-whites and former captives. He was in Haiti to cover the 2010 earthquake and was very angry at the failure of the outside world to help Haiti properly and by the UN’s carelessness in deploying Nepalese soldiers with cholera there, so that thousands of Haitians, who had no immunity to the disease, subsequently died of it. He remained dedicated to Haiti’s cause until his death. Phillip was a very active member of both North Devon and Torridge Green Parties (and, I think, the Green Party in East London, where he lived from 2017). He attended meetings, advised, nagged, cajoled, encouraged, and tirelessly pounded the streets, leafleting and canvassing for various candidates. He certainly was instrumental in getting Greens elected. He also campaigned for Caroline Lucas in Brighton, for Molly Scott Cato in Bristol and for other Green candidates in Dorset and the Isle of Wight. Phillip was the author, or co-author, of several books, including Central America’s Indians (1984). The Maya of Guatemala (1989), Return of the Indian: Conquest and Revival in the Americas (1996), Tainting Evidence: Inside the Scandals at the FBI Crime Lab (1998), Collapse: When Buildings Fall Down (1999). I’ve seen David as a single dad bringing up three wonderful children and encouraging them to become Labour party and union members and passing on to them his values of equality and justice. David’s eldest daughter now works for the NHS. I’ve seen him as a dedicated nurse of 35 years, whose commitment to patients drew admiration and praise from NHS colleagues. I’ve seen him as a talented photographer, recording demos, rallies, marches and campaigning events. Together we’ve campaigned locally and nationally to save our NHS – organising demos and rallies in London and Oxford with David speaking at local meetings and to national TV and press; holding street stalls in all weathers to give out materials to raise public awareness of the work of Keep Our NHS Public (David was a member of Oxfordshire KONP) and the true facts & figures relating to NHS cuts; marching alongside Ken Loach, sharing a platform with Jonathan Ashworth and working with Jeremy Corbyn on publicity materials highlighting the need to save our NHS from cuts and privatisation. And for the last year of his life, I saw him dealing with a diagnosis of terminal cancer. One of David’s many qualities was that he was always looking outwards not inwards – inclusive and bringing people together from NHS campaigns across the country. He did that in so many ways – through his relentless social media presence, TV and radio appearances, photography and writing – he was a regular on the Victoria Derbyshire show. Making such an impression with his presentation of the facts, articulate argument against cuts and privatisation, and dignified, calm approach that Victoria tweeted her sorrow and condolences when she heard that he had died. David worked closely with the People’s Assembly, KONP and HCT. 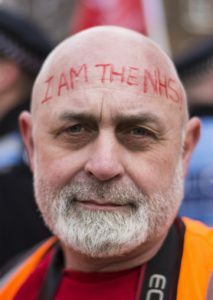 He was involved with national campaigns including #BursaryOrBust and #ScrapTheCap as well as protests against the STPS, local health service cuts and closures. He wrote his own blog and numerous newsletters, tweets and posts on all these issues. David encouraged and inspired so many, gaining respect and love from fellow NHS campaigners, work and union colleagues and Labour Party members at all levels. It was David who encouraged NHS campaigners from across Oxfordshire – including myself, Norman and Gwynne – to join KONP and add our voices and effort to support their work. the shadow front bench, in a hospital bed, in a doorway in Oxford or in scrubland in Northern France. This is why the inclusive values of the NHS – as originally founded – were so important to him. “stay angry and keep on doing what you’re doing.” He was always giving of himself and connecting us – to the very end – providing the framework and the glue to create the widest possible solidarity and effective action. Throughout all this, David made time to be the best sort of friend and comrade – challenging, encouraging and inspiring. His humanity and friendship has profoundly changed my life, my outlook and my self-belief in the most positive way – and I know he has had this effect on many others. He’ll continue to inspire us, he’ll be with us shoulder to shoulder but I will miss him more than I can express. I found a short poem that made me think of something that David might say to us today – encouraging us all to live our lives with happiness and compassion while continuing the fight – together in solidarity – to make the world a better place in general and particularly to save our NHS. It’s also very much “David” to offer comfort to us – as he did in health and illness with such love, dignity and generosity of spirit.